The Scramble At Moore Medical Center As The Tornado Hit : Shots - Health News Nick Stremble, a registered nurse and manager at the hospital, described what he saw Monday. As winds ripped through the facility, people started "to tumble and roll and be pushed down the hall," he said. A Moore Medical Center patient sits in the parking lot after a tornado damaged the hospital on Monday. A massive tornado swept through the Oklahoma City area Monday afternoon, leaving ruin in its path. 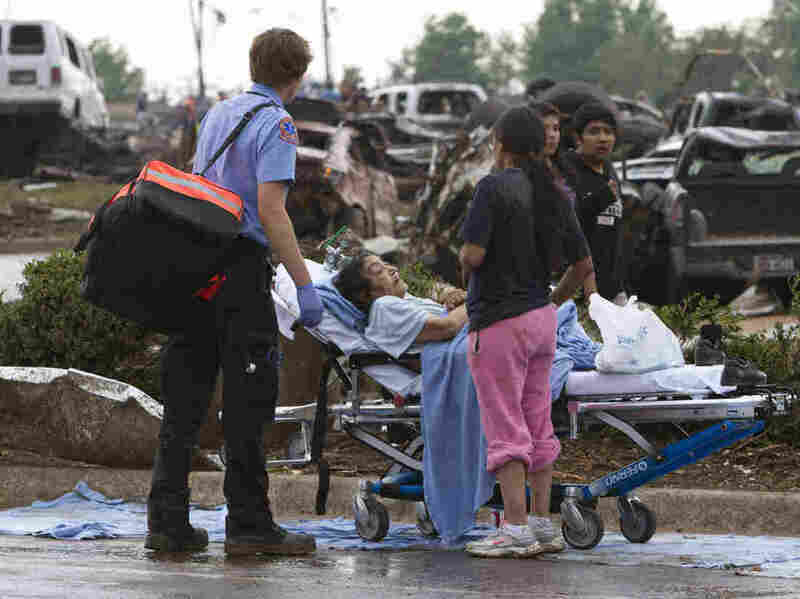 Moore Medical Center, which stood directly in the tornado's path, was devastated. But the workers, patients and their families in the hospital escaped. Nick Stremble, a registered nurse and manager at the hospital, told Shots Tuesday what he saw. "My ER is destroyed," he said. "My department was at the Moore Medical Center. I mean it's wiped out. The building is roped off so we're not doing anything there." About 250 or 300 people were inside as the storm approached. The staff was able to direct everyone to designated zones located in the center of the hospital. "[We] were able to move everbody to a safe location ... [and] get everybody where they needed to go and kind of hunkered down," Stremble said. "I could see the debris in the air, and there was no mistaking it was going to be hitting the hospital. It was just right in front of me, so I ran downstairs to the safe zone and let everybody know they needed to hunker down. You could hear the noise picking up and wind kind of picking up and howling. And you can start to feel pressure on the doors, so I kind of braced the door with my back, trying to keep the door closed." "My door got [blown] inward and I got pinned between the door and the wall. ... I was facing down the hall, and I could see all the folks being hit with the wind that was coming through the building, and the people that were kind of along the wall just kind of starting to tumble and roll and be pushed down the hall. And they all kind of ended up in a pile, down in front of another set of doors." He said it's tough to comprehend the damage. "You can't recognize your landmarks — everything is just flat. It's disorienting to look around and not know where the streets should be." The staff at Moore Medical Center staff is now working at other branches of the Norman Regional Health System and preparing for the possibility of more storms and more patients.